Howdy, are the OnePlus 5T owner moreover a techie who always wanted to taste the sweetness of Android updates? 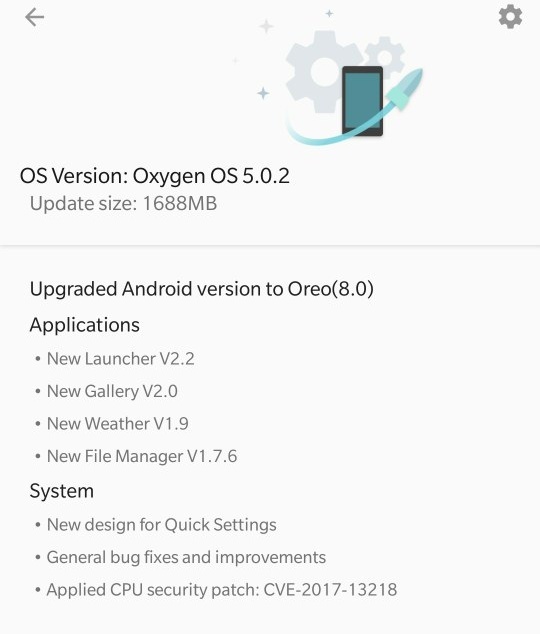 Well, it’s not the latest Android 8.1 but entirely new, The Oneplus Released Android Oreo 8 Based OxygenOS 5.0.2 OTA for OnePlus 5T. Some extras: OnePlus added an APK called Mkey, this is a font resource that was provided officially for India for local font compatibility needs. This app can be uninstalled by users if not needed or wanted, but we are required to provide it. As always, this OTA will is incremental which means that it will reach a small percentage of users and the begin a broader rollout will be in a few days. If you can wait then its well and good to appear an OTA update on your OnePlus 5T, but in case if you can’t here are some easy steps by following the same you can get the updates instantly. First, visit Google play store. Open the app, select the location as Canada and tap on connect. Once the VPN gets connected, you are right to download the official OTA update thereby. Now navigate to Settings >> System updates. >> check for updates. The new OTA update should appear there, tap on download. Once the update gets downloaded tap on reboot. Reboot will take a few minutes keep up your head calm, and once the phone boots up you are in the new update. If you like to share any feedback, then navigate to https://forums.oneplus.net/feedback/. Let us know if there are any doubts or facing some issues regarding Oneplus Released Android Oreo 8 Based OxygenOS 5.0.2 OTA for OnePlus 5T directly via comments below.